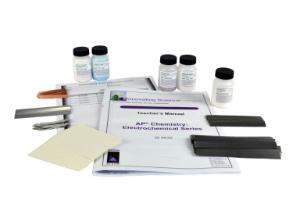 Students will study electrochemical series. The electrochemical series is built up by arranging various redox equilibria in order of their standard electrode potentials (redox potentials). When a strip of metal (an electrode) is placed in water the metal has a tendency to go into solution as ions, with a simultaneous build up of electrons on the metal strip. This process produces an electrical potential difference between the metal and solution which is called an electrode potential (Eº). Ordering information: Includes Copper Metal Strips, Zinc Metal Strips, Magnesium Metal Strips, Iron Metal Strips, Aluminum Metal Strips, Filter Paper Strips, Copper Sulfate EZ-Prep, Zinc Sulfate EZ-Prep, Magnesium Sulfate EZ-Prep, Iron Sulfate EZ-Prep, Aluminum Sulfate EZ-Prep, Teacher's Guide and Student Copymasters.